Coast beard-heath Cyathodes parviflora, copyright Stephen Bain. The Styphelieae are a group of ericaceous shrubs with fleshy fruits. Characters (from Kron et al. 2002): Shrubs. Leaves alternate, entire, with leaf base narrow and one to several longitudinal veins having abaxial fiber cap that contacts abaxial epidermis. Flowers in terminal or reduced axillary racemes; bracts several grading upward in size, or one, mostly small and persistent, sometimes leaflike and caducous; bracteoles 2. Flowers 5-merous. Calyx lobes ciliate, persistent; corolla sympetalous, cylindrical, the lobes straight, spreading or recurved, mostly valvate in bud, occasionally imbricate. Stamens 5, epipetalous; anthers monothecal, with or without appendages. Pollen in monads, sometimes in tetrads or shed as reduced tetrads with one or more cells aborting. Ovary 2–11-locular, each with single ovule, placentation apical, style not impressed. Fruit drupaceous and brightly coloured, sometimes splitting to release endocarp, with sometimes splits into separate pyrenes. [B00] Braby, M. F. 2000. Butterflies of Australia: their identification, biology and distribution vol. 2. CSIRO Publishing: Collingwood (Victoria). [C08] Cambage, R. H. 1908. Notes on the native flora of New South Wales. Part VI. Deepwater to Torrington and Emmaville. Proceedings of the Linnean Society of New South Wales 33 (1): 45–65, pls 1–2. [GMD11] George, A. S., N. L. McKenzie & P. Doughty. 2011. A Biodiversity Survey of the Pilbara Region of Western Australia 2002–2007. Records of the Western Australian Museum Supplement 78 (1). [G04] Gibson, N. 2004. Flora and vegetation of the Eastern Goldfields Ranges: part 7. Middle and South Ironcap, Digger Rock and Hatter Hill. Journal of the Royal Society of Western Australia 87 (2): 49–62. [H87a] Haviland, E. 1887a. 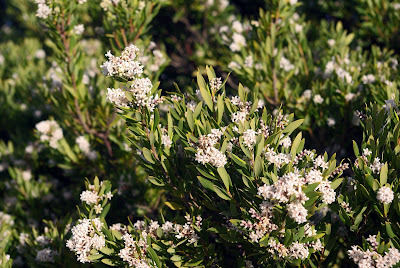 Flowering seasons of Australian plants. No. I—List of plants indigenous in the neighbourhood of Sydney, flowering during July. Proceedings of the Linnean Society of New South Wales, series 2, 1 (4): 1049–1051. [H87b] Haviland, E. 1887b. Flowering seasons of Australian plants. No. II. Proceedings of the Linnean Society of New South Wales, series 2, 1 (4): 1103–1104. [H03] Heads, M. 2003. Ericaceae in Malesia: vicariance biogeography, terrane tectonics and ecology. Telopea 10 (1): 311–449. [KJ02] Kron, K. A., W. S. Judd, P. F. Stevens, D. M. Crayn, A. A. Anderberg, P. A. Gadek, C. J. Quinn & J. L. Luteyn. 2002. Phylogenetic classification of Ericaceae: molecular and morphological evidence. Botanical Review 68: 335–423. [LK00] Lowrie, A., & K. F. Kenneally. 2000. Three new species of Stylidium (Stylidiaceae) from south-west Western Australia. Nuytsia 13: 293–302. [M65] Michener, C. D. 1965. A classification of the bees of the Australian and South Pacific regions. Bulletin of the American Museum of Natural History 130: 1–362. [MK08] Mockford, E. L., & P. D. Krushelnycky. 2008. New species and records of Liposcelis Motschulsky (Psocoptera: Liposcelididae) from Hawaii with first description of the male of Liposcelis bostrychophila Badonnel. Zootaxa 1766: 53–68. [ME70] Moore, L. B., & E. Edgar. 1970. Flora of New Zealand vol. 2. Indigenous Tracheophyta: Monocotyledones except Gramineae. A. R. Shearer, Government Printer: Wellington (New Zealand). [MM09] Mound, L. A., & M. Masumoto. 2009. Australian Thripinae of the Anaphothrips genus-group (Thysanoptera), with three new genera and thirty-three new species. Zootaxa 2042: 1–76. [M87] Mueller, F. von. 1887. Some hitherto undescribed plants of New South Wales. Proceedings of the Linnean Society of New South Wales, series 2, 1 (4): 1105–1110. [N91] Norris, K. R. 1991. General biology. In: CSIRO. The Insects of Australia: A textbook for students and research workers 2nd ed. vol. 1 pp. 68–108. Melbourne University Press: Carlton (Victoria). [OS04] Obbens, F. J., & L. W. Sage. 2004. Vegetation and flora of a diverse upland remnant of the Western Australian wheatbelt (Nature Reserve A21064). Journal of the Royal Society of Western Australia 87 (1): 19–28. [RL05] Rafferty, C., & B. B. Lamont. 2005. Selective feeding by macropods on vegetation regenerating following fire. Journal of the Royal Society of Western Australia 88 (4): 155–165. [S95] Smith, G. T. 1995. Species richness, habitat and conservation of scorpions in the Western Australian wheatbelt. Records of the Western Australian Museum Supplement 52: 55–66. [WO88] Wakabayashi, M., & H. Ohba. 1988. Cytotaxonomic study of the Himalayan Saxifraga. In: Ohba, H., & S. B. Malla (eds) The Himalayan Plants vol. 1. The University Museum, University of Tokyo, Bulletin 31: 71–90. [W91] Williams, P. A. 1991. Subalpine and alpine vegetation of granite ranges in western Nelson, New Zealand. New Zealand Journal of Botany 29: 317–330.